Home » Davao Events » Business Engagement » Upcoming Event: Lose Weight, Get Active…Fight Diabetes! 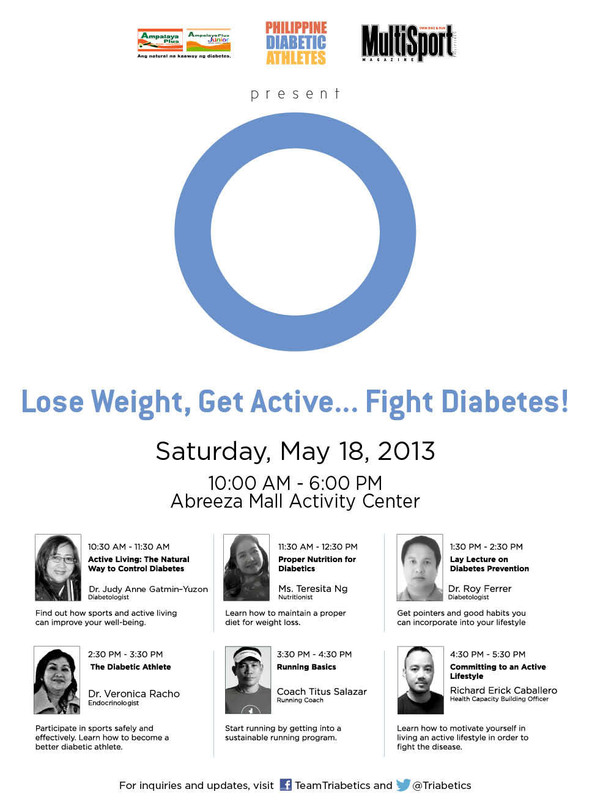 Upcoming Event: Lose Weight, Get Active…Fight Diabetes! The Philippine Diabetic Athletes (PDAT), a non-stock, non-profit organization that seeks to inspire, educate, and encourage Filipino diabetics to manage their disease through an active and healthy lifestyle, is bringing its fourth leg of seminars titled “Lose Weight, Get Active… Fight Diabetes!” to Davao City. The fourth leg of this seminar series will be held on May 18, 2013 (Saturday), from 10:00 A.M. to 6:00 P.M. at the Abreeza Mall’s Activity Center. Diabetics, candidates for diabetes, as well as their family members are invited to be a part of this event to gain a deeper understanding of the disease, and learn about lifestyle changes that can help lessen the impact of diabetes in their daily lives. Find out how sports and active living can improve your well-being. Learn how to maintain a proper diet for weight loss. Get pointers and good habits you can incorporate into your lifestyle in order to control your disease. Participate in sports safely and effectively. Learn how to become a better diabetic athlete. Start running by getting into a sustainable running program. 4:30 p.m. – 5:30 p.m. Committing to an Active Lifestyle. Learn how you can keep an active lifestyle and continue to control you disease the natural way. Philippine Diabetic Athletes, Inc. (PDAT). For more information you may email triabetics@gmail.com and look for Ms. Amanda Manait, PDAT Secretariat. © 2019 Davao Portal. All Rights Reserved.